Minimally invasive spine surgery—often abbreviated as MISS—uses advanced technology and innovative techniques to treat back pain and neck pain caused by a variety of spinal disorders. What is minimally-invasive spinal surgery? Spinal surgery is traditionally performed as an “open surgery.” Open surgeries require large incisions (typically 5-6 inches long) to allow surgeons to properly view and access the areas on which operations occur. However, in recent years technological advances have allowed many surgeries, including spine surgeries, to be performed without the need for large incisions. These more advanced surgical procedures – which are considered minimally-invasive – avoid significant damage to the muscles surrounding the spine. In many cases, that results in less pain and a faster recovery after surgery. What spinal surgeries use minimally-invasive techniques? Since the 1990s, minimally-invasive surgeries have been used for many common spine procedures, including decompression surgeries and spinal fusions. Decompression relieves pressure on spinal nerves by removing portions of bone or spinal disks. Spinal fusion welds together vertebrae (the small bones of the spine) in order to relieve pain. What occurs during a traditional spinal surgery? In order to access and see the spine in a traditional surgery, a doctor makes a large incision and moves muscle tissue to the side. However, moving muscle can damage surrounding soft tissue, and also affects more anatomy than would otherwise be required. As a result, there can be an increased potential for muscle injury, and patients may have pain after surgery that didn’t exist prior to the surgery (i.e., pain that originates from the surgery itself and not the underlying condition being treated). This can lead to a lengthy recovery period. What occurs during a minimally-invasive spinal surgery? 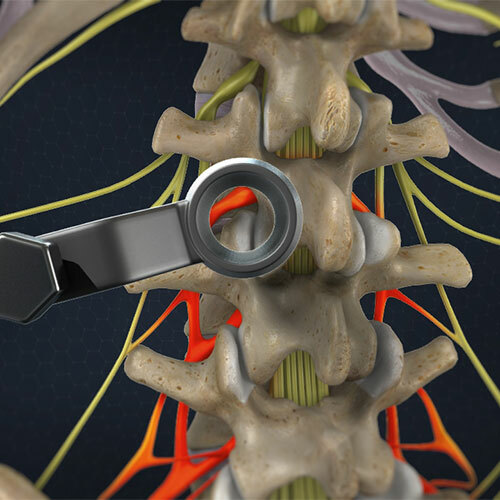 A minimally-invasive spinal surgery is performed with a special tool called a tubular retractor. During the procedure, a small incision is made and the tubular retractor is inserted through the skin and soft tissue down to the spinal column. This creates a tunnel to the small area where the problem exists in the spine. The tubular retractor holds the muscles open and is kept in place throughout the procedure. Any devices necessary for the surgery (e.g., screws or rods) are inserted through the retractor, and any bone or disk material that is removed from the spine exits through the retractor. Some spinal surgeries require more than one retractor. To view the procedure, surgeons are guided by fluoroscopy, which displays x-ray images of the procedure in real time on a screen. What is the prognosis of minimally-invasive surgery? Compared to traditional spinal surgery, the benefits of minimally-invasive surgery include less injury to surrounding muscles and tissues, less bleeding, shorter hospital stays, and shorter recovery time. Most surgeries today can be treated with some aspect of minimally invasive surgery. Since certain conditions require standard open treatment, schedule an appointment with a spine care specialist at the Florida Spine Institute to determine whether you are a candidate. Minimally Invasive Spine Surgery. American Academy of Orthopaedic Surgeons (2012). Available at: http://orthoinfo.aaos.org/topic.cfm?topic=A00543. Last accessed December 26, 2014.